If you wonder about ICANN's Whois Accuracy Program (WAP), the following information will be useful for you. If you have further questions please do not hesitate to contact our technical support. What is the ICANN Whois Accuracy Program? The Whois Accuracy Program requires registrars to verify and validate new or changed domain holder contact information. Information needs to be verified when one of these three actions occur: a domain registration, a domain transfer, or changes of contact information to the already existing domain. Only the contact information of the domain holder is verified, and no other contact information of the domain. Domain holders will receive a notification which asks them to validate the given e-mail address. By clicking on the link, the domain holder once verifies the e-mail address for all domains for which this e-mail address is specified. This means that an e-mail address only has to be verified once, and not for each domain anew. Domain holders are granted 15 days to verify their contact information. addresses need to be verified within this time limit, otherwise all domains for which the unverified e-mail address is indicated will be temporarily suspended until the domain holder provides verification. What are the advantages of the WAP? Through this policy, ICANN wants to keep all domain holder contact information in the whois up to date at any time. ICANN argues that this will impede criminals who often use false or other people's information when registering domains. This could help to protect users from data abuse and spam. Implementing ICANN's policy demands rather large technical and administrative efforts. Furthermore, domain holders should be particularly careful when handling and submitting contact information, as time limits for the verification are short and thus a temporary suspension of the domain might be impending. Furthermore, abuse activities might become more frequent. The process might be misused for fraud by sending e-mails that look like verification e-mails but spread malware or tap information through phishing. Which TLDs are affected by the changes? 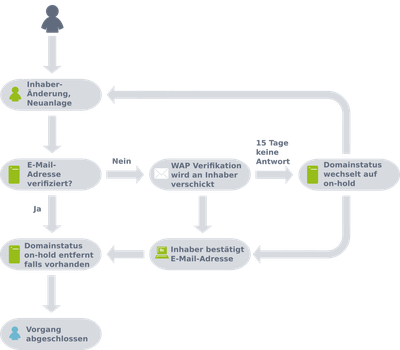 All ICANN accredited registrars need to comply with the new requirements, thus all domains administrated by ICANN. This concerns all generic domains, for example .com, .net, .org, .info, or .biz. Country-Code TLDs such as .de, .fr, .ru or .us are not affected. What do WAP verification e-mails look like? If your e-mail address remains unverified by [DATE], we are obliged by ICANN to suspend the respective domain. A suspended domain will not resolve and, therefore, will not be usable. The suspension can only be lifted once your e-mail address has been verified. What do I have to do when I receive a WAP verification e-mail? As soon as you receive this e-mail, please follow the instructions. Click on the link in order to verify the indicated e-mail address and also in order to successfully complete the domain registration, domain transfer or change to contact information if you have started any of these actions. The verification requires written form via e-mail in order to be true evidence. Please pay attention to time limits. Make sure to reply within a 15 day period in order to impede domain suspension. How will the process of domain registration change? When you register a domain and you use an e-mail address that has already been verified earlier, then nothing will change. The process will go as easy and uncomplicated as always. Please read the next question to see what happens when using unverified e-mail addresses. How will the process of domain registration change when using an unverified e-mail address? When you register a new domain and use contact information that has not been verified yet, your domain status will be changed to »on hold« until the e-mail address is validated. When the registrant then receives the verification e-mail and clicks on the link, the domain will automatically be activated and the »on hold« status will be removed. How will the process of transferring or updating a domain change? Again, when you transfer or change a domain and use an e-mail address that has already been verified earlier, then nothing will change. The process will go as easy and uncomplicated as always. How will the process of transferring or updating a domain change when using an unverified e-mail address? Transfers and changes to a domain can be initiated with an unverified e-mail. However, the domain holder's e-mail address needs to be verified within 15 days, just like for a new registration. If registration within 15 days fails, the domain will be suspended and the status will be changed to »on hold". This means that domains without verified contact information will no longer be available 15 days after making a change.